The giant slug (for such it was) emerged into the room; Elysia fired a Fireball at it and although it damaged the monster, it didn’t stop it. Alagon swung into action, moving in to attack the slug as it got a volley of arrows from Alurax, Ferros, Gullhar and Garry. It tried to bite at Alagon but missed; the party then fired their second shots and Elysia let rip with a Magic Missile; at 9th level, she could deliver some powerful blasts of magical energy and those, combined with the arrows that had been fired, finished the horrible thing off for good. 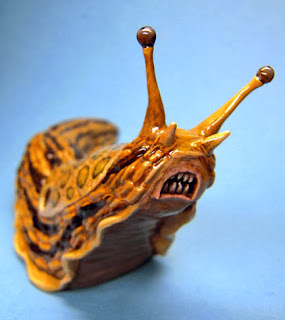 The party now had to decide where to go next; after some indecision, Ferros took the initiative and led everybody off down the passageway from which the slug had emerged. He was accompanied by Alagon, Garry, Gullhar and Wolf, with the others bringing up the rear. As they reached the corner of the corridor, Alagon suddenly sensed a strong feeling of evil from the darkness ahead. Reluctant to enter, Alagon slowly edged round the corner, with the rest of the party providing back-up. Gullhar scanned the room with his infravision but could see nothing. As the party stepped into the room, four sinister figures came out of the gloomy corners. They were almost transparent and radiated sheer malice. Nobody knew what they were but Ferros knew that they were undead and raised the holy symbol of Foik, which drove them back into the darkness again. Having cleared the room of opposition, Ferros spotted a dead body lying in one corner and before you could say ‘Foik’, said cadaver was part of the Undead Army. The party headed off down the passageway again, making sure that the sinister undead figures were not waiting for them. At the end of the passageway, they came to a room where they saw two more bodies on the floor. Again, Ferros stepped in to animate them but this time, there was a nasty surprise waiting. As the two new zombies stumbled towards ‘Master’, Ferros and Alurax noticed that there were white worms writhing in the putrescent flesh. Ferros promptly turned them, which destroyed them and Alurax hurled an oil bomb in, roasting what was left of the bodies and the worms. 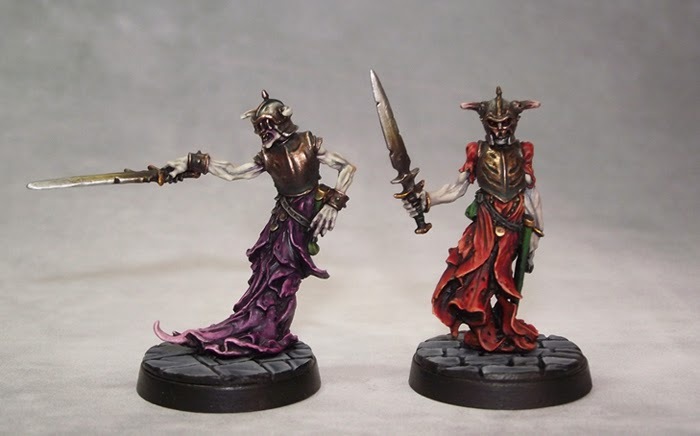 Ferros' new zombie henchmen were destined for a short unlife. The team decided to exercise caution from thereon and checked the room out thoroughly. Alurax, who’d had experience of nasty things lurking on the ceiling, looked up and saw that there was a shaft opening directly above their heads. It was thick with cobwebs and darker objects moved within it. Alurax fired an arrow up into the webs and by chance, hit a spider which dropped down onto the floor, dead. Alagon reached up and managed, by use of a torch, to burn the first few feet of cobwebs. Having explored the only other passage leading from this room, which took them back to the clay jar chamber, the party thought that they had run out of options and decided to do what they had done on the previous level – send Gullhar round to see if he could find any secret doors. The elf set off back up the passage but he had only gone a little way when he met the four sinister undead coming towards him. He shouted out and alerted Ferros, who ran down to join him. 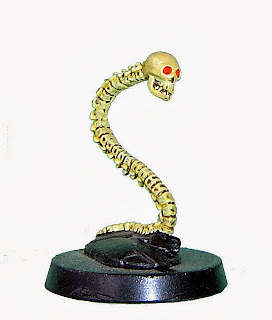 The cleric raised the symbol of Foik again but this time, either his faith was lacking or the undead had grown bolder. They were not stopped and Ferros decided that discretion was the better part of valour. The party beat a hasty retreat to the room with the spider shaft, where they decided to make a stand. The party deployed for action, with Wolf, Alagon, Ferros and Garry in the front row. Elysia and Elador were thinking about using their Teleport spells to take the party out of danger but then realised that with the weight restriction of the spell, they could only take one person each. 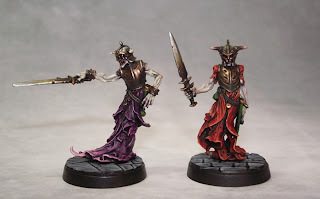 As the undead came drifting into the room, Elador recognised them as spectres. Ferros tried to turn them again but he had no luck this time either. Elysia readied her Wand of Illumination and cast Sunburst which damaged but did not destroy the spectres. They closed in on the front rank of the party and battle was joined. The spectres failed to hit Garry and Alagon but poor Wolf was hit and drained. 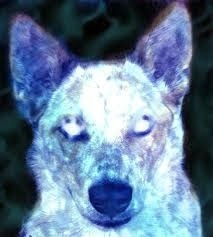 As his lifeless body hit the floor, an eerie mist rose from it and started to take on the shape of a spectral wolf. Bet you're wishing you'd taken me for more walks now, eh, FORMER master! Just as one of the spectres loomed in with its claws to drain Ferros, Alurax fired a magic arrow from the back rank and the undead predator dissolved into the darkness, destroyed in a very lucky hit. The next round, Alurax used the same tactic to destroy the spectre that had killed Wolf as it was moving in to attack Lydia. Elysia fired another Sunburst at the spectre that was trying to hit the very nimble Alagon and destroyed that. The final spectre closed in on Garry and everyone thought the gnome was about to be drained but he managed to dodge the chilling grasp; Elysia tossed her wand to Elador who fired Sunburst again at the spectre and destroyed it. That left the problem of the spectral wolf – Elysia took back her wand whilst Elador grabbed the fallen body and teleported out with it. It was his aim to return to the town, many miles distant and see if the Council of Elders could do anything for the fallen familiar. A final Sunburst took care of the spectral wolf. The party had triumphed but not without cost. Disturbed by the prospects of other monsters lurking on this level and waiting to attack, Elysia fired a fireball up the spider shaft, clearing it of cobwebs and other debris (including some human bones from less than fortunate previous adventurers), then cast Fly and carried the party up the thirty feet or so of shaft to a small room with a narrow walkway around the opening. A passage led off it and they followed this until it came out into a room in which there was a flight of descending stairs and two other passages. There were also three dead bodies in the middle of the room. Ferros wondered who they were and decided to use Speak with Dead to find out. The corpses revealed that they were low-level adventurers and had been killed by the spiders from the shaft (Ferros had not really thought about the questions he was going to ask and only had two to use). Satisfied that the bodies represented no threat, he decided to animate them. 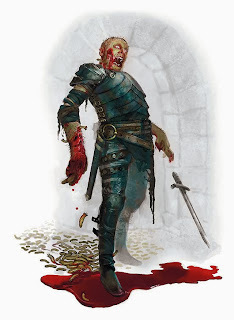 Unfortunately, not all threats are visible ones and as the bodies rose from the floor, their ghosts emerged from the mouldering bodies and advanced on the cleric who had the temerity to disturb them. Ferros took one look at the advancing phantoms and shrieked, taking to his heels in terror – down one of the passageway that the party had not yet explored. He also aged ten years but that was the least of his worries. One of the ghosts followed him and the others homed in on Elysia and Lydia, who had assumed that their cleric would sort out this latest undead problem. Elysia resorted to her usual tactic of Sunburst but unfortunately this did not destroy the ghosts fully. They struck at Lydia, turning her from an 18-year-old to a paladin in her mid-forties. Elysia was touched by the second ghost and became 73. She still had her wits about her because another Sunburst finished off the ghosts. Meanwhile, Ferros had fled into a room where the first ten feet of floor was black and glistening. He failed to jump it and ran through it instead. His boots started to char and corrode and as he ripped them off, he realised that he was in a dead end. His plight concentrated his mind and he recovered his wits, only to see one of the ghosts drifting down the corridor towards him. He attempted once again to use the power of Foik, but said deity must have been busy elsewhere, because the ghost just kept on coming. Just as Ferros thought his number was up, Elysia appeared in the room, having teleported in. 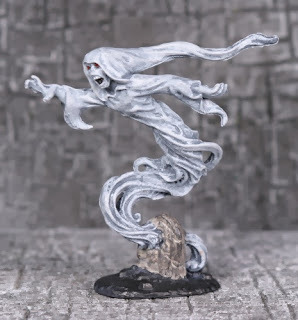 She fired a Sunburst at the ghost, who appeared weakened, though not destroyed and used a Fly spell to pick up the cleric and soar past the ghost. As they did so, the ghost reached out and made a grab for them. He touched Elysia, who went from 73 to 113 in an instant. She crashed to the floor and Ferros ran into the main room to alert the party to their magic-user’s predicament. Elysia, in her dotage, now lay on the floor whilst the ghost decided to attend to the rest of the party who were a greater threat; he could always come back and finish off the extremely elderly magic user for afters. The party prepared to defend themselves against what they now recognised as some of the deadliest adversaries they had ever encountered. There’s late to the party and then there’s only reading this book this year. 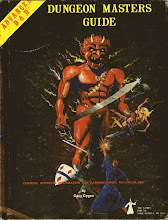 It was published in 1984, when I was just 19 and Joe Abercrombie was 10 (or possibly 9). All this time, it’s been off my radar and only now, having read stuff that’s been compared to it did I decide to find out what all the fuss is (was) about. So what is it all about? Well, Legend can best be described as what might have happened if a 60-year-old Conan with a bad back and a gammy knee was drafted in to defend Helm’s Deep against the Mongols. If you feed that combination through the directorship of John Ford, you’ve got a pretty good idea of what to expect. Of course, with a summary like that, and it being fantasy, you’ll probably be expecting action of the most military sort. To tell the truth, Legend has plenty of fighting but there isn’t an overwhelming amount of it. We get battle scenes in which named characters participate but the fighting isn’t where the real story takes place. That is reserved for the sections of the book where Gemmell peels back the outside of his characters and looks into their souls. Having done this, he reveals that his characters are just as fallible and human as the rest of us. There are no larger-than-life heroes here, unless you count Druss, and even he has his shortcomings, although as a paragon, personifiying the virtues of nobility, sacrifice, duty and honour, he has few equals. In essence, what Gemmell has done with this book is to humanise Tolkien, giving us people with whom it’s very easy to identify, rather than Kings and Princes with Destinies and magic swords. There are flaws in the book, of course; Rek’s romance with Virae seems to progress very fast indeed whereas it might have been a better idea to have had them meet at Dros Delnoch and there find each other. The length of the book is perhaps not quite enough for us to witness the fates of various characters, some of whom are killed off-screen, as it were. But given that Gemmell is no longer with us, we’re unlikely to get a Director’s Cut of the book and so must be satisfied with what we have – and thankful for it. Gemmell is lauded by those who came after him – less charitable souls than I might dub them epigones – and he has an annual fantasy awards ceremony named after him. There are many debates as to his legacy on fantasy with many claiming his standard and marching forward with it. 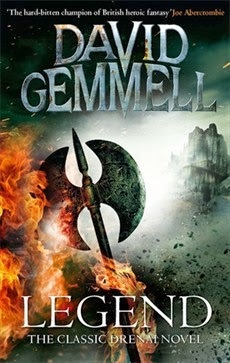 I suppose that rather than the vanguard of gritty fantasy as it is now defined, Gemmell was in fact the rearguard of heroic moral fantasy, where there was something larger than the character to which they could give allegiance, be that a principle or a cause. It seems odd that he has been beatified by a genre which seems, over recent years, to have drifted away from the underlying values which made him such a popular and enduring author. Acting quickly – and unsure of how much longer the floor around Alurax would continue to support him - Gullhar (who had returned to the narrow corridor) pulled the doughty fighter out and onto firmer ground. Whilst he was busy doing this, Larsh detected somebody coming down the corridor behind him. It turned out to be a small figure armed with a short sword and wearing studded leather armour. He introduced himself as Gary the Gnome, a thief who had heard of a great treasure inside the dungeon and had come to investigate. While Gullhar and Alurax were trying to work out what to make of the new arrival, he had skipped nimbly (but not as nimbly as Alagon now could) across the hazardous floor of the slime room, then bypassed Ferros and Alagon, who were still cleaning themselves up after the attack of the Shambling Mound. On the far side of the Mound Room was another passage, down which the little thief now strode. The rest of the party followed on; Alurax and Gullhar managed to cross the slime room floor, disturbing more of the loose floor but not suffering any dire consequences. Ferros’ two zombies which had only been created a few minutes earlier were dragged across on a rope, bits of them falling off as this happened, although nothing particularly important. At the end of the passage, the party found a room with four statues on plinths at each point of a compass rose inlaid in the floor. In each plinth was a slot, about the size of a coin. Gary entered the room, approached the first plinth from behind, reached round and put a coin into the slot. The statue animated and sprayed out a golden dust onto the space in front of it. Gary touched and tasted the gold spray; it tingled when he touched it and didn’t taste of anything. Even as he watched it, the dust vanished like snow on a sunny day. Ferros entered the room next and with Gary, tried to move one of the statues but it was very firmly fixed and neither of them could budge it. Alurax’s idea was to get everybody to put a coin in each of the slots whilst one of Ferros’ zombies stood at the centre of the compass rose. This produced the same effect but as the zombie was not standing in front of any of the statues, the showers of gold had no effect. The experimentation continued; the zombie was stood in front of each statue in turn so that he was showered with dust from each of them but there seemed to be no obvious effects on him. By now, people were starting to get bored of the statues and their gold dust. 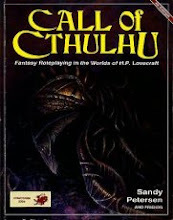 They made plans to settle down for the night to regain spells and hit points, whilst Gary set traps at each door of the room to prevent unwanted incursions. Ferros deputed his zombies to stand sentry for a similar purpose. Nothing disturbed the party during the night. However, in the morning (or so they believed, since they were deep below the surface of the earth), Ferros started to get telepathic messages, through Rufus, from Relic. Elysia, who had last been seen in the entrance to the dungeon, was contacting him to find out where they were. The magic user had used her new spell, Teleport, to return to the Moat House in order to see if she could recruit additional firepower for the party in the form of Elador. However, she had not realised when doing so that she could only use the spell for one-way trips and so was stuck at the Moat House until she had rested up and relearned the spell. Now, she had teleported back to the last place that she had seen the party and needed to know where they were in order to rejoin them. Thus guided, the two magic users made their way through the dungeon until they found the party, who were having a discussion about what to do next about the statues. Elysia was most interested in who Gary was, although his comments about searching for great treasure were met with a curt warning not to steal any of the party’s treasure. Alurax had taken the initiative regarding testing the statues; he tried another gold piece in one of the statues, then decided to test Ferros' hypothesis that the plinth pulverised the coin and sprayed out the remnants. He tried to use a silver piece and the same gold spray came out, disproving that idea. Finally, with no real idea of what the statues and their gold spray did, Alurax decided to use himself as a guinea-pig and stood in front of the eastern statue, placed a coin in the slot and waited. He was sprayed with the gold dust and somehow knew that he had acquired a particular power – the ability to put himself into a meditative trance and increase the efficacy of any healing magic cast upon him. Delighted by this, he then tried the other three statues and found that he had gained the ability to survive without harm at up to –20 below freezing, the ability to breathe underwater and the ability to summon a sandstorm in any desert and travel up to 30 miles in it. When the rest of the party realised that far from having ill effects, the statues actually gave out good things, they all decided that they wanted a share as well. 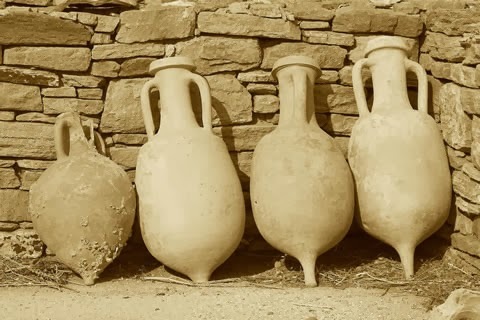 Once they had all been sprayed by all four statues, they pressed on down the further corridor, which led to a small room with a single, iron-bound chest inside. Gary rushed in (no surprise, considering he was being run by Galadeus’ player) to check it out. He tried to break it open but it was so tough that he nearly broke his hammer. He turned his attention to the lock, which seemed very intricate, and got out his thieves’ tool kit. Unfortunately, whilst trying to pick the lock, he triggered a spray of gas against which he was able to save. With only slight irritation, he made a second attempt and this time, he heard the lock click open. 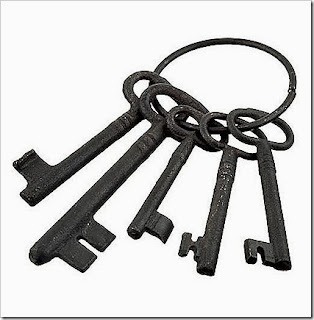 He pulled the lid of the chest open and found inside a set of iron keys, each with a piece of coloured cloth attached. The party was baffled by this discovery but they took the keys nevertheless, supposing that they had some significance and would come in handy later on. The party had now explored every room and corridor and there seemed to be nothing further to find. If this was the case, it was a very small dungeon and they suspected that there was more to it than met the eye. Gullhar decided to see if he could find any secret doors or entrances that they might have passed by initially and moved through each room, checking and rechecking. Eventually, he found something in the narrow passageway that linked the slime room with the rat chamber. Ferros, Gullhar and Gary gathered round the door and prised it open, finding beyond a room in which lay a dead body, a dagger in one hand. As Gary rushed towards it, another door opened in the far wall and through it came six shadows, heading straight for the hapless gnome. Ferros stepped forward and raised the holy symbol of Foik, which sent the sinister black floating shapes racing back through the doorway and off down the passageway beyond. Alurax arrived and checked to see if Gary was all right; he also took the dagger from the corpse’s hand. The presence of a slash wound on the body’s arm showed that the knife had been used to end its owner’s life; perhaps he had no intention of becoming a shadow. The party gathered and moved on down the passage, turning a couple of corners till the corridor virtually doubled back on itself. At the end of the passage, a flight of stairs headed upwards. Gary, in the lead, climbed them and at the top, was confronted by a passage running left and right. He took the left-hand one and it led him into a room where he found four clay jars sealed with pitch, in which were written intricate and mysterious hieroglyphs. Clay jars - irresistible to gnomes. Ferros was soon on hand to read them, casting Comprehend Languages, and was able to announce that they were a warning not to open the jars. Gary ignored this and decided to throw one of his darts at the first jar. It clipped it and knocked it over; it smashed on the floor and out of it came a cloud of screaming phantoms who swirled around Gary’s head, howling into his ears. Only when they had disappeared into the darkness did Gary realise that he was now deaf. Inside the shattered jar was a bony snake-like creature with a human skull, which rose up and lunged at Gary. It bit him but he was able to resist the sinister power of the creature by dint of his gnomish resistance to all things magical. Alurax and Elysia stepped forward to deal with the creature – the combined effect of his trident and her Magic Missile blasted the thing into a mass of bony smithereens. No, I am not undead, despite appearances to the contray, so turn on, cleric, turn on, hahaha! The second jar held another set of keys with pieces of coloured cloth on them; the party filed these under E for Enigmatic. The third jar held 19 silver balls, each with a single hieroglyph on. Ferros’ Comprehend Languages was still running but all it revealed was that each hieroglyph was a single letter of an ancient alphabet. That just left the fourth jar, which was broken open to reveal a small figurine of a scorpion. Gary decided that he wanted this and pocketed it; a bad move as no sooner had he done this than it started to grow, bursting out of his pocket and landing on the floor. It continued growing and attacked both Gary and Alurax, who had rushed in to help him. 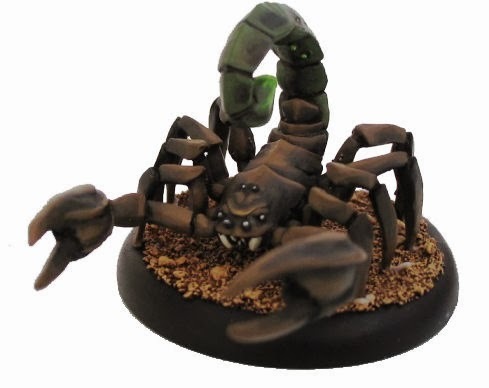 The two huge pincers missed the gnome but the sting caught Alurax, wounding him but failing to overcome him with its poison. These guys are mean critters. I must use one on a low-level party one day. Elysia flew in to pluck Gary out of the fray whilst the scorpion turned its full attention to Alurax, catching him with one of its pincers. Alurax returned the compliment and Ferros fired an arrow that finished off the huge monster. The party started to clean up, Alurax chopping off the tail of the scorpion and trying to bottle its poison. On the far side of the room was a solid stone door which Alurax started to investigate but could find no way of opening. Meanwhile, Gary started down another passage into a large chamber, in which was a flight of stairs going down, as well as a dead body surrounded by large purple fungi almost as tall as the gnome himself. The rest of the party recognised them as shriekers and concluded that it was a good idea to send in somebody who couldn’t hear anyway and was therefore immune to the deafening sound they would make. As Gary stepped into the room, a flagstone on the floor shifted under his feet and the stone door which Alurax had been checking out slid open. From the opening came four wraiths which headed for Elador, who was closest to them. Ferros had been thinking about entering the shrieker room but when Gary had volunteered, he had stayed back. It was a lucky thing that he did so because he was perfectly placed to step forward and let the power of Foik and drove the wraiths back into their chamber again. Gary moved further into the room, setting off the shriekers and investigating the body. There was nothing particularly interesting about it and when Gary popped back through to report his findings, Alurax recommended that he destroy the shriekers, which he did with an oil bomb. 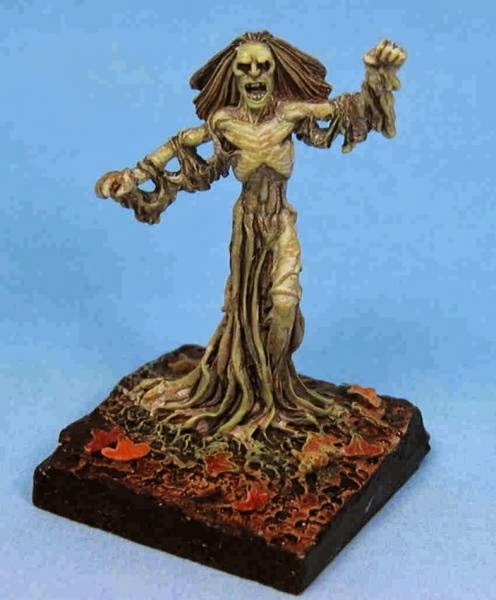 While the rest of the party remained in the room of the clay jars, Gary pressed on, finding another room on the far side of the shrieker chamber (he didn’t seem to be interested in the descending staircase). This had a passage leading off it and a mysterious trail of slime on the floor that led down the other corridor. In the far corner of the room was an open doorway and beside it, a lever mechanism which had six settings. Gary checked out the lever, pulling it up and down but nothing seemed to happen. He also examined the slime but it appeared to have no obvious effect on him. The rest of the party now came through the shrieker room and joined Gary; Alurax took a turn at moving the lever up and down but achieved no more success than had the gnome. The party decided that it might be worth setting up camp here and Gary started to get his traps out again. However, just as he was starting to do that, Elysia heard something further down the passageway down which the slime trail led. It was a sinister squelching and slithering and it was getting closer. Alurax fired an arrow but could not see where it had gone or even if it had hit something. He flung an oil bomb up the passage and its sudden blaze illuminated a huge bulk with what looked like antennae pushing its way down the corridor. It was big, it was horrible and it was heading straight for them.